Google Gmail users can now save up to 25,000 contacts. Earlier this limit was 10,000. Also, now you can use up to 128 KB per contact. Earlier you could use only 32 KB space per contact. This means you can now save more details per contact. This was announced by Google Gmail team on their official blog. 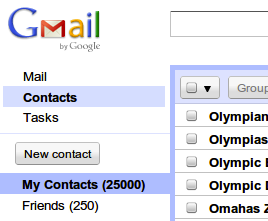 I have no idea how many Gmail users even uses 10K contacts, and how many will be benefited by 25K contacts limit. May be its just to lure more Gmail users.